Yesterday was the annual “Legacy of Literacy” breakfast benefitting the Aberg Center for Literacy in Dallas, TX. My purpose was to “do good,” not to have my heart opened. I heard of the Aberg Center a couple of years ago when a friend invited me to attend a “show” starring Martha Barnette and Grant Barrett of NPR’s “A Way With Words,” one of my favorite programs on any kind of media. It was a benefit for the Aberg Center, and I ― knowing that I was about to retire ― put it in mind as a place to stay busy and perhaps do some good. Yesterday’s breakfast was poignant for me because a young woman who had been in my class spoke as the newest Aberg Center high school graduate. She’s on to college in the spring semester ― a Hispanic woman, mother of three, who dropped out of high school when she was 15 to have her first child as she told the breakfast crowd. 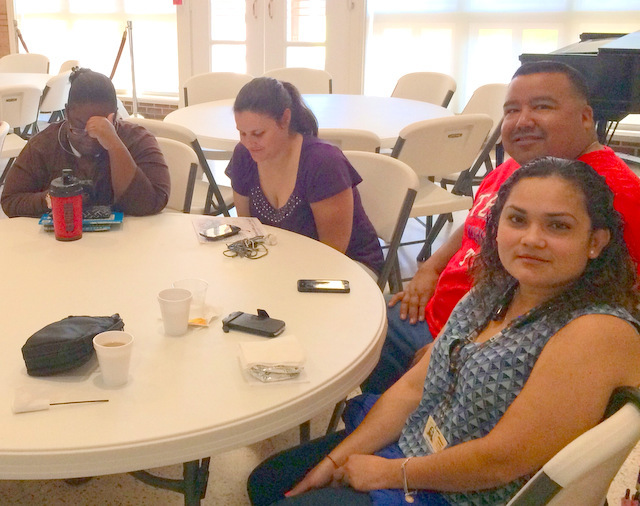 Mileyvi Medrano de Herrera and her husband are now, ten years later, working together to continue building a life for their children (and themselves). Mileyvi’s talk was a “thin place” for me in the way the Episcopal liturgy used to be (and might still be if I ever went to church). Now, as an almost-apostate, asking “What’s it all about?” comes as close as I can to any sense of religiosity. Asking the question is itself the answer. He goes another step, however, that I am not prepared to take ― explanations of what he does believe in. One aspect of my gratitude for the “thin places” at Aberg, the gift of interacting with and (possibly) helping the students learn useful and spirit-opening skills, is that it helps me overcome my depression, an uncomfortable theme running through my life. I misspoke. It does not help me “overcome” depression. It helps give it meaning. I am aware of the danger of this line of thought. I am not looking for justification or martyrdom here, simply for a way to think about the mysterious. By “mourning” Jesus, of course, means doing without what the world calls peace and prosperity: He means refusing to be in tune with the world or to accommodate oneself to its standards. Such men mourn for the world, for its guilt, its fate and its fortune. While the world keeps holiday they stand aside, and while the world sings, “Gather ye rose- buds while ye may,” they mourn. They see that for all the jollity on board, the ship is beginning to sink (Bonhoeffer, Cost of Discipleship). The human-family-wrenching refugee crisis emanating from Syria (and elsewhere). The unbearable, unspeakable, murderous poverty in much of the world. The privilege and power of the few that contribute to that poverty. The destruction of relics of the history of mankind by ISIS. The racism and xenophobia that informs the social structures of nearly every nation. The subjugation of American women as a tenet of a religious belief about conception. The continuing and unabated arming of the world, both nations and individuals. I am preparing to fly in a couple of days to one of the places of the greatest “mourning” in the world. Intractable mourning. Made worse because it is not necessary. Because we, we Americans, are making possible its continuation. This will be my third trip to Palestine/Israel. The first time I went, I thought I would “do good,” that I would learn about the decades-long conflagration and do something to help (help what or whom I was not sure). It is probably not clear how my thinking proceeded from Mileyvi to Palestine. They are, for me, part of the same process. Making myself vulnerable to the processes of other people, to help if I can, simply to be with them if I cannot. And to rejoice in, but know I am not responsible for changes in the world―in one life or a nation. If there is a God, I’m pretty sure that’s where I will find God. I list here four articles that might help someone understand why Palestine/Israel is a place of mourning. I invite you to read. If you think these are one-sided, all you need is to look at Main Stream Media for another point of view. East Jerusalem. 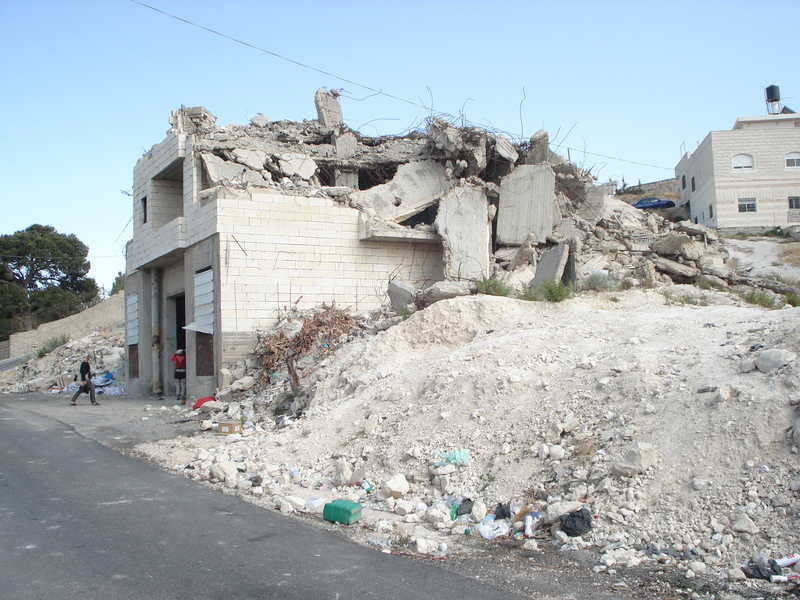 Palestinian home destroyed by the Israeli government, 2008. Photo: Harold Knight.